So far 2011 has been an interesting to say the least. Stocks and commodities have been jumping around with high volatility generating mixed trading signals. This choppy price action typically indicates trends are in their late stages. The late stages of a trend is very difficult to trade because volatility rises meaning larger day to day price swings, and at any time the price could either drop like a rock or go parabolic surging higher in value. Generally the largest moves take place during the final 10% of trend, but with a sharp rise in price keep in mind the day to day gyrations are much larger than normal, hence the false buy and sell signals back to back on some investment vehicles. Taking a look at the charts it’s clear that we are on the edge of some sizable moves in both stocks and commodities. It’s just a matter of time before a correction is confirmed or this current pullback in stocks is just a dip (buying opportunity). I am in favor of the longer term trend at work here (bull market) but it only takes a 1 or 2 bid down days and that could change. This chart shows intraday price action with my market internals. It is signaling a short term bottom within the overall uptrend on the equities market. The big question is if this is a just an opportunity to buy into this Fed induced bull market or the start of a larger correction? Currently I am bullish but the next couple trading sessions could confirm my bullish view or a correction could be unfolding. Until then, we must remain cautious. Gold has staged a strong recovery in the past four weeks. But it has yet to break to a new high. 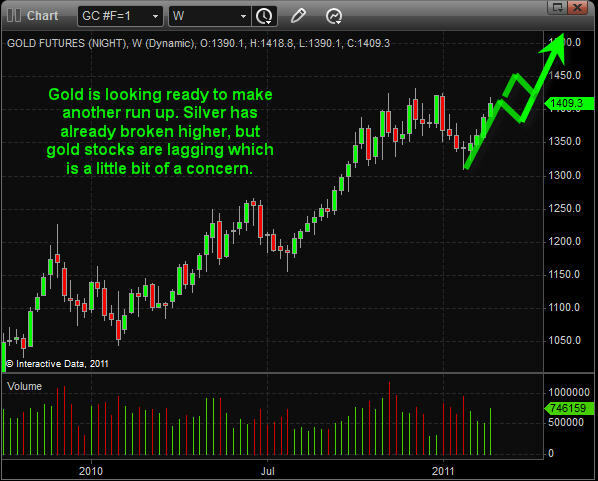 I do feel as though it will head higher because of the way silver has been performing (new highs). But it is very possible we get a pause for a week or two before continuing higher. This long term view of the dollar shows a MAJOR level which if penetrated will cause some very large movements across the board (stocks, commodities and currencies). In short, a breakdown will most likely cause a spike in stocks and commodities across the board which could last up to 12 months in length. 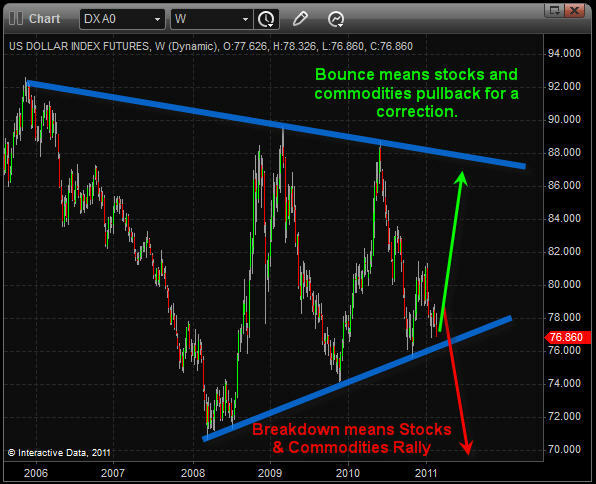 On the flip side a bounce from this support zone will trigger a pullback in both stocks and commodities. This weekly chart is something we must keep our eye on each Friday as the weekly candle closes on the chart. In short, 2011 has been interesting but trading wise it’s has yet to provide any real low risk trade setups which I am willing to put much money on. There are times when trading is great and times when it’s not. It all comes down to managing money/risk by trading small during choppy times (late stages of trends), and times when we add to positions as they mature building a sizable portfolio of investments which I think will start to unfold over the next few months. 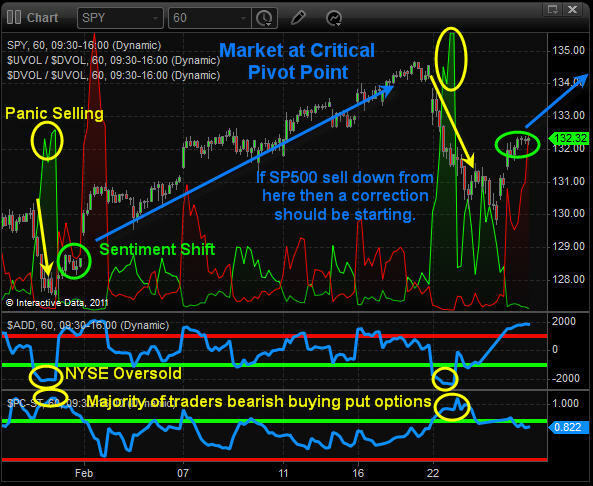 I continue to analyze the market probing it for small positions as this market flashes short term buy and sell signals. Last week we say a lot of emotional trading and that typically indicates large daily price swings should continue for some time still so keep trades small and manage you positions.